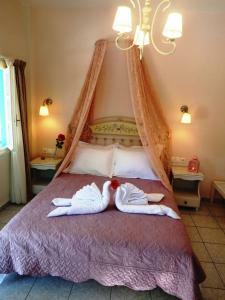 The Evizorzia Villas is a family-run establishment located a few minutes walk from the black sand beach of Perissa. Please inform Evizorzia Villas in advance of your expected arrival time. For this, you can use the special requests section when making the reservation or contact the accommodation directly. The contact details appear on the booking confirmation. 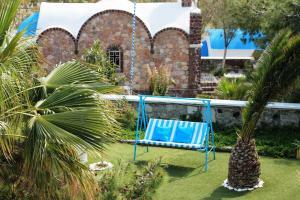 This large studio was completely renovated in the winter of 2012 and is individually decorated. Includes bathrobes, slippers and toiletries. There are products for breakfast in the fridge. In addition, flavored muffins and brioches are provided. Large, modern studio with a kitchenette and a furnished patio overlooking the garden and pool.